If you haven’t picked up a newspaper for quite a while, you probably would never know that Google has been selling contextual ads on them. Shocked? Well, I am, but after some quick thinking, it made perfect sense. Why just stick to one medium when you can venture into others? It’s probably this kind of thinking that prompted Google to start Google Print Ads. 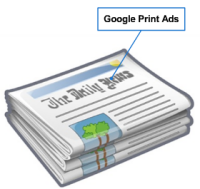 Unfortunately, Google Print Ads is shutting down. Google has finally decided that selling contextual print ads in news publications isn’t the best strategy for them to get in to the print ad business. Spencer Spinnell, Director of Google Print Ads explains in his announcement why. We launched our Print Ads program with 50 newspaper partners in November 2006 and, with the cooperation of our partners, were able to expand the network to include more than 800 U.S. newspapers. Since then we have worked closely with advertisers and newspapers to create a product that would bring a new source of revenue to publishers. So it looks like traditional media and new media aren’t mixing well. Google still has radio ads and TV ads which are hopefully more profitable than the print ads. Still the loss of the print ads is a poor sign for the fusion of old and new media. There is probably a solution for Google and publications and obviously it isn’t print ads. Google will still be studying what solutions and fusions they can come up with to mix the two.